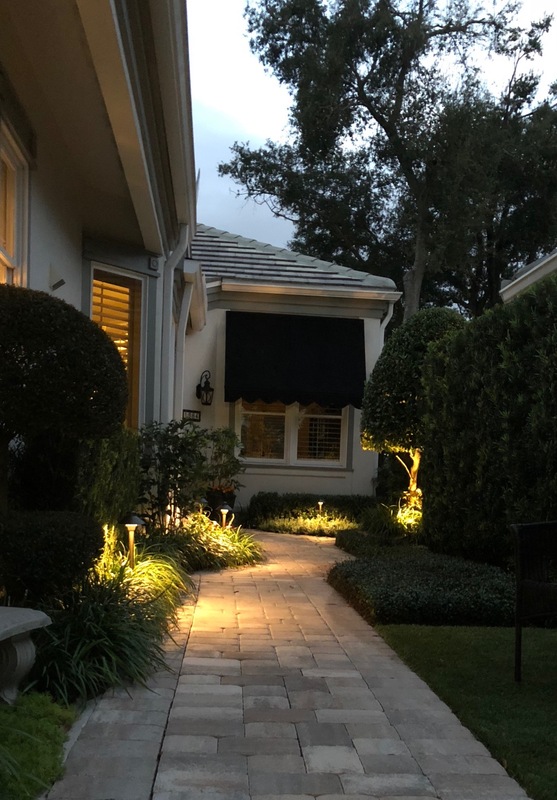 Older properties with existing low voltage landscape lighting systems typically suffer from one major flaw: they’re powered by high cost halogen bulbs. We envy home- and property owners with fixtures that have lasted decades. These are usually high-grade units made of heavy metal, like brass. Though the finishes may have patinaed beautifully, the power bill associated with halogen bulbs can often lead owners to question the economics of their system. Retro fitting an existing system with LED bulbs is incredibly simple. Usually it’s as easy as replacing a halogen bulb with a comparable LED unit. That said, not all LED bulbs are created equal. Your typical box store bulbs aren’t going to cut it if you’re looking for long-term illumination. And you should be looking for long lamp life! The two biggest benefits for moving from halogen to LED is to reduce power use (therefore reducing the power bill) and getting some serious longevity out of bulbs. Halogen bulbs in landscape lighting systems burn out within one to two years. Bulbs from manufacturers like Unique Lighting and Brilliance LED have lamp lives of 40,000 – 50,000 hours. If you run your system every night for eight hours a night, at a lamp life of 50,000 hours, these bulbs will last you 17 years! We did a great in-depth post about the cost differences between halogen and LED here. After examining the costs associated with each, we found that though you’ll spend more for LED at installation, you’ll actually save money over the life of the bulb when compared to halogen. During LED conversion, your contractor should grease the bulbs and sockets to help protect against corrosion and water damage. They should also examine each fixture for cracks, paint chips (if powder-coated) and wiring issues which may cause early bulb termination. If you’re getting less than 12-volts at a fixture, there may be other repairs needed. Here in Orlando and Central Florida, we have the benefit of mild winters which means more time outdoors. If you’re looking to extend your living space outside, we highly recommend low-voltage landscape lighting. See our article here on questions to ask a potential contractor. From path lighting to deck lighting, bistro lights to tiki torches, we have designers and trained installers to make any vision come to life. Give us a call today to schedule your free consultation.